Underground storage tanks (USTs) are the leading source of groundwater contamination across the country. Because nearly one-third of all USTs are suspected of leaking, federal and state laws require owners and operators of USTs to ensure that their tanks comply with certain performance standards and to implement what is known as corrective action to cleanup contamination associated with leaking USTs. In addition, when USTs are closed or permanently taken out of service, owners and operators of the tanks must remediate any contamination caused by the USTs. Many properties may have USTs that were abandoned prior to the modern environmental era when states allowed USTs to be left in place and filled with an inert substance such as cement, sand or even water. 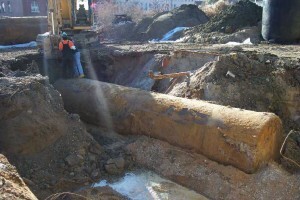 Other times, the tanks may have been removed but piping associated with the tank system left behind and contaminated soil may have simply been backfilled. Because these tanks were closed before the current UST regulations were adopted, the tanks may not have registered and may not appear on current databases. However, these former tanks and tank systems could serve as a continuing source of contamination. UST contamination is not limited to commercial properties. Many single-family and multifamily properties currently or in the past have relied on heating oil tanks. Although heating oil USTs are not subject to federal regulation and may be unregulated in many states, property owners may still be liable for contamination caused by current or former tanks that may be located on their properties. As a result, it is important for property owners and their lenders to assess the potential for the presence of former tanks. We can help clients evaluate and address the various regulatory issues associated with USTs including determining responsibility for previously abandoned USTs on a site, negotiating cost-effective investigation and cleanups, and assist clients to obtain funding from state UST cleanup funds that may be available to help defray the cleanup costs.